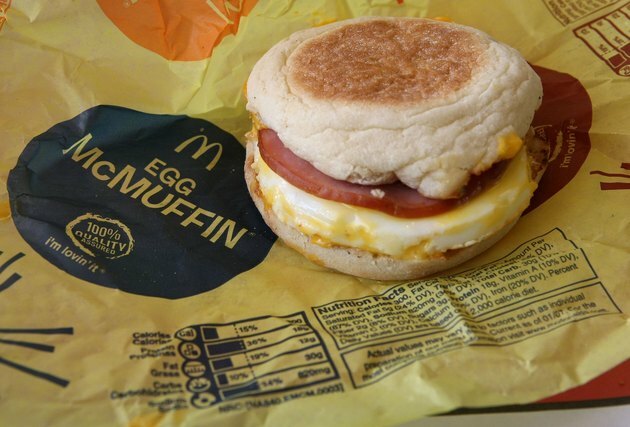 What's Really Inside an Egg McMuffin? Cristina Goyanes is a Brooklyn-based writer and editor, specializing in wellness, fitness, sports and travel. She is a contributor to national men's and women's lifestyle publications and websites. When it comes to breakfast, the most appealing morning meals are usually the ones you can grab and gobble on the way to work. Sure, scrambling a few eggs doesn't take long, but it's so much easier to swing by the drive-thru under the golden arches. According to one 2010 survey, one in five Americans choose to start their day at McDonald's. An Egg McMuffin, a classic breakfast item that's been on Mc-menu since 1975, may seem like a healthy choice with its five simple ingredients, including those protein-rich eggs that promise to fuel you in the a.m., but truth be told, you can find close to 50 ingredients in just one item that makes up this sneaky sandwich. 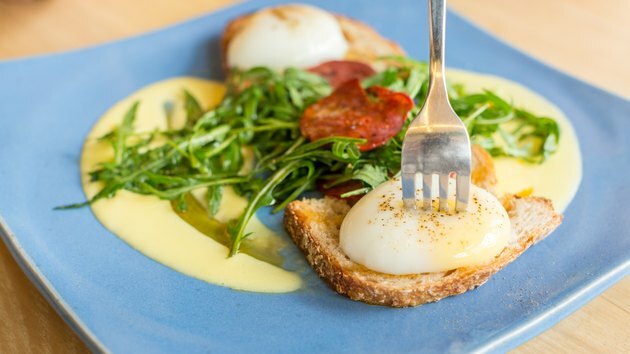 Read on to find out what eggs-actly you're biting into. THE DETECTIVES: Mira and Jayson Calton, Ph.D., a husband-and-wife team who published "Rich Food, Poor Food." NUTRITION LABEL: 300 calories, 17 grams protein, 12 grams fat, 29 grams carbs, 730 mg sodium. LISTED INGREDIENTS: English muffin, egg, pasteurized process American cheese, Canadian style bacon, salted butter. ENGLISH MUFFIN: Carbs aren’t always the enemy, but in this case, they really are. This muffin may contain up to eight genetically-modified ingredients: enriched flour, high-fructose corn syrup, yellow corn flour, corn meal, citric acid, soy lecithin, soybean oil and/or canola oil. That's in addition to water, yeast, and two percent or less of the following: salt, calcium sulfate, calcium carbonate, calcium citrate, rice flour, barley malt, artificial/natural flavors, dough conditioners, calcium propionate and potassium sorbate (preservatives), and (more) soy lecithin. a) Enriched wheat flour. Wheat as our grandparents knew it—the four-feet-tall “amber waves of grain”— isn’t the same. For the past 40 years, farmers have been manipulating the gene to grow a crop of two-feet-tall dwarfed wheat that contains gliaden protein, which produces a morphine-like compound that binds to brain receptors and triggers overeating up to 400 extra calories a day! Gliaden has also been linked to inflammatory issues from irritable bowel to heart disease. That's not all: There's also wheat gluten, which may cause digestive problems, headaches, brain fog, fatigue, and other symptoms, and amylopectin A, which is responsible for “wheat belly” (you know, the new “muffin top”). b) High-fructose corn syrup. You know the drill: Stay away from this stuff! Why? Besides giving you a sugar high, it depletes your body of essential minerals and increases food cravings, which can lead to lots of serious issues like obesity. c) DATEM. Short for diacetyl tartaric acid esters of monoglycerides, this dough conditioner ensures that all muffins are made to look the exact same. Though it is FDA approved, it has been linked to heart muscle fibrosis and adrenal overgrowth in animals. EGGS: Not to sound like an episode of Portlandia here, but are they pasture-raised? Nope! These USDA Grade A eggs don't come from happy hens frolicking and pecking on pastures. They actually come from chickens who've been cooped up in dark factories where they don't even have room to spread their wings. They never see light, which means they're missing vitamin D, and their diet largely consists of only soy and corn. Free-range hens with healthy, natural diets, on the other hand, have seven times more beta carotene, three times more vitamin E, two times more omega-3's, and two-thirds more vitamin A.
PASTEURIZED PROCESS AMERICAN CHEESE: Like factory chickens, no happy cows here either. This highly processed dairy product most likely comes from a cow that's been treated with synthetic hormones (rBGH) to boost milk production by about 10 percent. This practice is not only dangerous to the animal (they become lame, infertile, and suffer from infected udders) but also the consumer, hence why it's been banned in Australia, New Zealand, Japan, and Europe. Humans who are exposed to this milk (and its dairy products) readily absorb its byproduct, insulin-like growth factor 1 (IGF-1), which has been associated with breast, colon, and prostate cancers. This cheese may also contain yellow 6 dye, a food coloring that's forbidden in Norway and Sweden due to cancer-causing compounds. CANADIAN STYLE BACON. Think pigs get it any better? Fat chance. They likely never set their hooves on a pasture and are probably on a strict genetically-modified food diet. So this pork is not going to be a good source of meat. Add in the other ingredients — like sugar (added just to make it more addictive), salt, sodium lactate, sodium phosphate, natural flavor (vegetable), sodium diacetate and sodium nitrite (preservatives)—and it’s definitely entered the dark side. The most dangerous content might be the sodium nitrate (used to brighten and preserve the bacon) because it contains poisonous residual heavy metals, arsenic and lead. What's the Verdict on the Egg McMuffin? THE SENTENCE: Make your own grab-n-go egg sandwich without the extra, unnecessary, and downright disturbing ingredients. We have a recipe below to show you how. 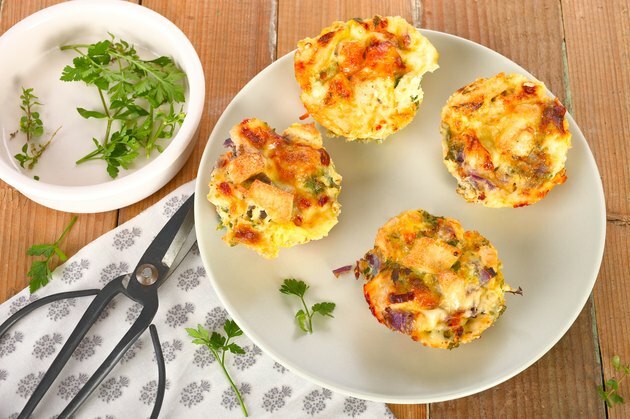 How Can I Make a Healthier Egg 'Muffin' at Home? DIRECTIONS: 1. Preheat oven to 325 degrees. 2. Grease a muffin tin with ghee, coconut oil, butter, or retained and collected fat, or use a nonstick tin. You will use only six of the muffin molds (perhaps seven depending on the bulk of vegetables and bacon). 3. Brown bacon and chop. Use the remaining bacon fat to cook onion and garlic until onion is translucent. 4. Beat eggs in small bowl and blend with sour cream, grated cheese, and desired organic seasonings. 5. Pour egg mixture into six muffin molds until two thirds full, keeping enough room on top for bacon and/or vegetables. 6. Mix vegetables and bacon in the now empty egg bowl and distribute evenly into the egg mixture. 7. Bake for approximately 25 minutes or until cooked through. Allow to completely cool before removing from muffin tin. What do you think? 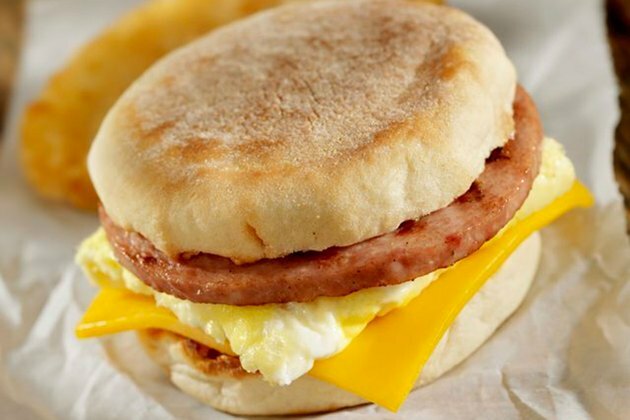 Are you OK with all the ingredients in McDonald's Egg McMuffins? Does it seem like it's safe to you? How often do you eat them? Would you rather make your own fast egg breakfasts from more natural ingredients? Do you want to see more articles exposing and discussing the ingredients found inside popular fast food menu items. Leave a comment below and let us know. What's Really Inside a Cinnabon Classic Cinnamon Roll?